Cracovia was established on June 13, 1906. This makes it the oldest continuously running football club in Poland and it will be 110 years in just three months. Since there will be no club football then and the regular season in Poland is coming to an end, vast celebration was carried out now. 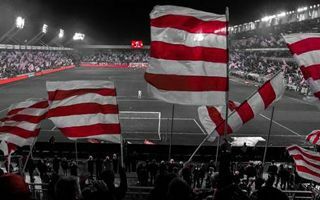 On Saturday, when Cracovia faced their league archrivals Legia Warszawa, possibly the only team raising the atmosphere at Stadion im. Józefa Piłsudskiego more than across-the-street rivals Wisła. Legia is first in the league, Cracovia so far pulled an unexpected third place, which meant a sell-out crowd was certain. The hosts give Saturday’s attendance at 14,000 people, of whom 774 came from Warsaw. This impressive presentation wasn’t the only one on Saturday. During the second half supporters also unveiled a massive banner that covered the north and east stands (roughly 150 meters or 500 feet). This one, however, wasn’t included in official post-game coverage by Cracovia, because it had controversial content. The flag read “Kibolska Subkultura Cracovia” (loosely translated: Hooligan Subculture Cracovia) and depicted two masked supporters. In a city marred by so called “football-related violence”, this statement might indeed not be one to brag about by the club.